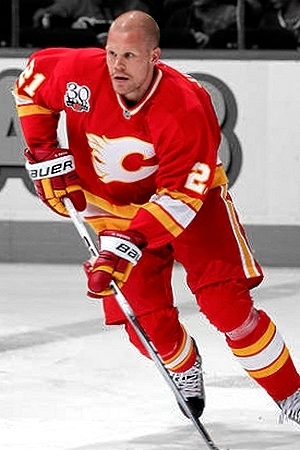 Olli Jokinen #21The Calgary Flames have officially stated their third jersey intentions for the 2010-11 campaign. And it's all about bringing retro back. The Calgary Flames announced today their third jersey for the 2010-2011 season will be the Flames Vintage jersey. In celebration of the Flames 30th Anniversary season this vintage jersey was worn five times in games versus the other five Canadian teams. The new third jersey for the 2010-2011 season will feature Vintage jersey striping and colours on the new innovative fabrics and cut that was introduced by Reebok for the 2007-2008 season. The Edge Uniform System was introduced to better complement today’s game and to help improve player performance. The third jersey will be worn up to 15 games next season. The release also mentioned that tonight was the final time the Flames would wear the vintage jersey this season. After the game, the jerseys were handed out to a couple dozen lucky fans, selected at random. So, what's changing? The biggest thing is that it will be a Reebok Edge jersey next season. It wasn't for the five games in which it was worn this season. Also, Olli Jokinen won't be wearing it, it's probably safe to say. But most importantly, Flames and throwback jersey fans alike will get to see more of it! Now if only they could put that flaming "A" on the front, that would really take us back. The Flames have also posted an article on their website about the third jersey. It has no new information. However, there is this cool locker room photo. The only thing disappointing about this announcement is we won't be anticipating a big unveiling of a fresh new jersey design. In fact, it flies in the face of what Flames president and CEO Ken King said some time ago. That being they were in the process of designing a black third jersey with a brand new logo. He said it would've been "a different look" for the Flames, and I always think that's cool to see. But it looks like they'll be putting that off for a while. Maybe we'll get a look at some of the prototypes one day. Fingers crossed. I'm glad that news came today, otherwise this next bit of info would've been by itself at the top of Icethetics for a while. And that would have been sad. 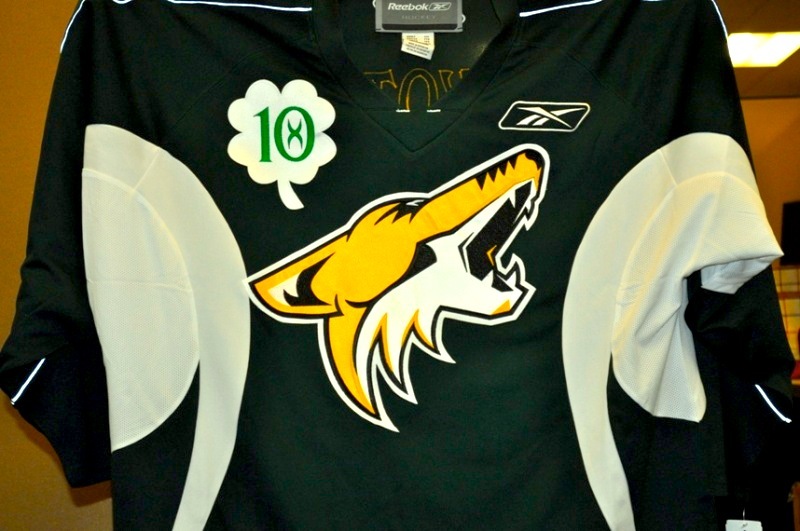 Coyotes go green!The Phoenix Coyotes will be auctioning off another set of special edition, autographed practice jerseys — this time to celebrate St. Patrick's Day. I know I mocked them the last time they did something like this, and it didn't go over well. But this time I'm keeping my mouth shut. Is it silly? Yes. Is it for a good cause? Yes. Let it be. Each Coyotes player has autographed a one-of-a-kind St. Patrick’s Day jersey with his name and number on the back. The jerseys will be available for bidding beginning at 9 AM Thursday, March 11. The auction will close at 10 PM on Tuesday, March 23. Proceeds from the auction will benefit Coyotes Charities, which is dedicated to enhancing the quality of life throughout Arizona communities by supporting non-profit organizations that promote healthcare, education, cultural arts and sports-related programs for children. Also take note of the number on the front in a little four-leaf clover, leaving no stone unturned for the leprechaun coyote (he's even gold!). 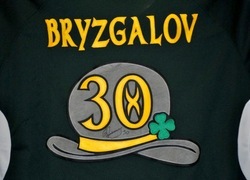 Bryzgalov's leprechaun jerseyNow I can't let you go without seeing the back of these bad boys. It's got the little leprechaun hat and everything. The good news for Bryz and his teammates is that they won't actually have to wear these in public. They're simply being customized, autographed, and sold to the highest bidder. And if you want a shot at being one of those bidders, you can find all you need to know at auction.nhl.com. They even have a Sean Burke #1 "alumni jersey" on offer. Interesting. All right, that about wraps it up, but I do have one more link for you. If you'd like to see the full jersey design, MVPToday.com has you covered. Though beware their green is not quite the green seen in these photos. Thanks to Dan for letting us know about this.